When Justice Reigns for Mixed Choir with Divisi (2016) was commissioned by the Lacroute Arts Series at Linfield College for the Linfield College Concert Choir, directed by Dr. Anna Song, who premiered the work on Sunday, October 23, 2016 in the Richard and Lucille Ice Auditorium (McMinnville, Oregon). Linfield College alumna Janine Applegate wrote her poem, When Justice Reigns, for this project on the theme of social justice. In it, she highlights our commonality and interconnectedness with others, while also mourning how hatred unravels the cloth of our society. To support these ideas musically, the song begins with a simple, unified texture, reminiscent of older hymns and protest songs. The stark middle section is built upon chanted pitches in the tenor and bass voices, while the unsettling upper voices mourn the lack of peace. During this section, the performers may highlight social justice issues that are especially important to them. I am grateful for additional artistic support from: Faun Tiedge, the student performers in the Linfield College Concert Choir, Brian and Kaisa Amer. Sunday, October 23, 2016 - 4:00 p.m.
Thursday, February 2, 7:30 p.m.
Friday, February 3, 7:00 p.m.
Saturday, February 4, 4 p.m. 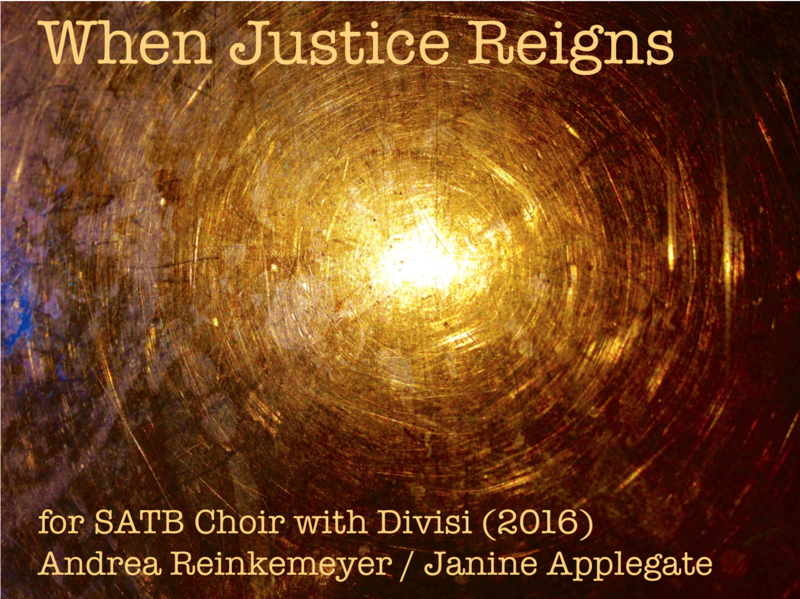 When Justice Reigns for Mixed Choir with Divisi (2016) from Andrea Reinkemeyer on Vimeo. Sunday, February 19, 7 p.m.
Saturday, July 21, 2018 - 7 p.m. Please RSVP by July 15, if at all possible. Copyright © 2016-2019 Andrea L. Reinkemeyer. All rights reserved.